FEATURE: Potaissa Turda have reached the Challenge Cup final just six years after being promoted to the Romanian League. Their story is hard to replicate in Romania. It has been an improbable but beautiful story for Potaissa Turda, the perennial underdog who has risen to the challenge and ultimately reached a European final. The second leg of the final v Sporting CP will be played on Saturday 27 May at 16:00 local time. You can watch all the action live on ehfTV. A small town, with only 55,000 inhabitants, is living and breathing handball thanks to an amazing team, whose swift ascension to stardom has been nothing short of stunning. Twelve years ago, Potaissa were briefly forced to leave Turda for Cluj-Napoca, some 30 kilometers away, due to the fact they played their second league games on a concrete court. Now, Potaissa are featuring regularly as a contender for the Romanian title and have reached their first ever European final. "The story is truly about passion and love for handball. When we started, we knew what we wanted to do, but we never splashed the money just to build a very good team. The idea was to take it step-by-step," said Flaviu Sasaeac, Potaissa's president. The Romanian side stayed true to its roots. The core of the team is still formed from players who helped Potaissa achieve promotion to the Romanian National League in 2011. The likes of Razvan Pavel, Raul Marian, Ionut Stef and Lucian Ignat have been playing for Turda for eight years, while Nenad Savic has been representing Potaissa for the past seven seasons. "Our concept is quite easy to understand. We are a family. We value the team more than any individual. This is why we have managed to take it up a notch season after season," added Sasaeac. After several years in contention in the Romanian League, Turda have become important for the national team as well. 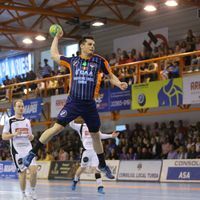 Three of their players were in the Romanian national team for the EHF EURO 2018 qualification games against Serbia in May. As a team with a limited budget, Turda are not attracting foreign players or Romanian stars in the fashion of Romanian League finalists Dinamo Bucuresti and CSM Bucuresti do. Instead, they rely on young talent bred in their local academy. Five hundred youngsters signed up when Potaissa had their first trials in 2011. Now, 200 players are plying their trade and hope to emulate their idols' performances in the next years. "We are looking for young talent to take over and to continue our performances in the next few years. The club is happy that the games are sold out and we have one of the hottest atmospheres in Romania right now," concludes Sasaeac. As handball is quickly becoming a phenomenon in Turda, the team’s performances are improving and their chances of silverware come closer year after year. The 37:28 defeat against Sporting in the first leg of the Challenge Cup final has not brought spirits down in Turda. The fans are pointing to the amazing comeback against Valur in the semifinals. Down 30:22 after the first leg, Potaissa turned the tables and powered to a convincing 32:23 win that brought the club into their first ever European final. As the Turda hall is too small for a European final, the game will be played in Cluj, but this does not mean that the loyal Turda fans will miss the trip. "It has been a hard season for us, with nearly 40 games played until now. But we are motivated, even if we lost in the first leg," concluded Horatiu Gal, Turda’s coach.